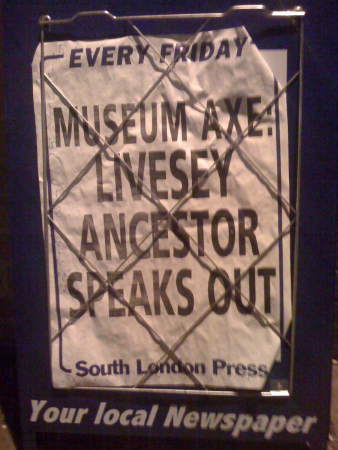 I live in SE17 with two young boys and just been told that the Livesey Museum on the Old Kent Road is apparently under threat of closure by Southwark Council as part of cost-cutting measures as early as April 2008. It's a unique resource in the area and a great place to take children (old and young) and it would be a real shame to lose it. Please visit the Livesey Museum website (www.liveseymuseum.org.uk)and sign the online petition - if you access the link to the facebook group they post, you'll find out about the letter they plan to send the press tomorrow (FRiday 9th Feb) and the Executive Meeting set for 7pm on Monday 12th where they say the budget cuts decision is due to be made. (This is my first post - though i've been a reader for a couple of years and found the forum and invaluable source of information and thought it would be a good place to spread the word even at this 11th hour!). Lets see how long it takes for Berkley to buy the building..I will sign the petition. Does anyone know the outcome of the council meeting on wednesday this week? Yes - the budget was approved and the museum will close. You've got till this Friday to visit before it shuts down.